Getting married? Congratulations!! As a bride to be, you are the cynosure of all eyes and this can be quite exciting and stressful too. 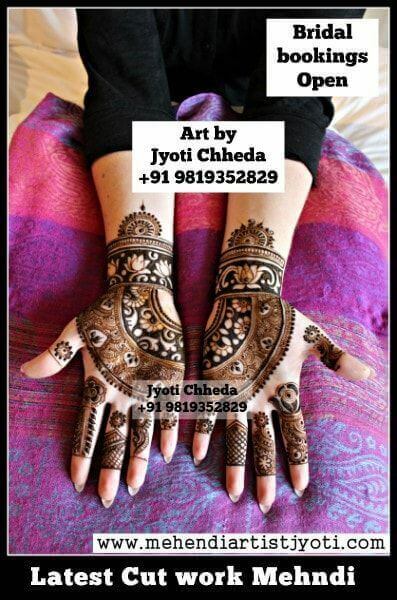 Bridal Mehandi artist, Jyoti Chheda will take the stress out of your preparations and will work up some awesome designs to leave you feeling divinely beautiful. We know that each bride is unique and our designs need to complement your wedding ensemble, makeup and of course your personality and choice. We know, through eons of experience what would be the right choice of Bridal Mehndi designs for you and will work with you to decide the right options (natural, glamorous, classic or contemporary). The first step towards a dream life. Truly amazing to commit to someone who mere mention can set your pulse racing. On this day, when you formally get engaged to your soulmate, the Henna designs on you should also make a very special statement. You can choose a style or pattern that your fiancé would love or you may select a combination of designs to get him to drop his jaws. Whatever be your decision, Jyoti Chheda Mehandi artist will deliver superb Engagement Mehendi design with sheer ecstasy to make this day truly memorable. The elaborate Indian Wedding goes on for several days. One of the most important events is the day of the “Mehandi Rasam”. This is the time when the bride gets adorned in the best of Henna Designs. A day full of fun, music, dance & celebration. The wedding party guest also gets themselves a nice design on their hands/feet as they would want. 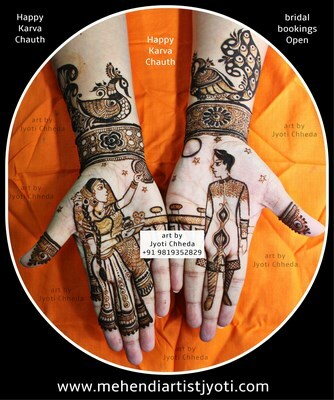 Jyoti Chheda's Mehendi team ensures that your Mehandi Rasam is like none experienced earlier. blessings mean Babies. They are a new found hope that keeps you excited about the future. Baby showers are hence special occasions that you celebrate to keep expectant mothers in high spirits. You literally shower the expectant mother with gifts and advice to bring in the young one into the world with smiles galore. The occasion is a preamble to new beginnings and new blessings. You can make that message obvious by bringing in a change with the lovely Godh bharai Mehendi design They add to the verve and give your celebration a whole new dimension. Not to mention, our own special assortment of divine mantras and hymns that will add to the spiritual quotient. On a day when you celebrate the festival of love and joy, wouldn’t it be great to adorn your hands and body with something that conveys the message to your friends or your beloved? Wouldn’t it be great to gift a great design to someone you love? Our designers will create the best of designs that signify your love for that someone special making this a new beginning on your journey to bliss. Are you Celebrating a Company anniversary, launching a product, Throwing a success party, celebrating for the newly promoted team members? Get high on the awards ceremony? Launching a book/novel/product Wait no longer. Call us and see us dazzle your team & invitees with our latest henna designs.